For most of my painting career, I have pursued this goal: do not overpaint the subject. I like abstraction and I want to get away from reality…the camera does that better than I ever could. My inclination is to leave a lot of mystery in my work. I prefer paintings that look partially finished and I like to see the drawing or sketch marks clearly visible. I also feel that I should introduce some elements of dry media at the beginning, in the middle and at the end. In the past I worked in watercolour (w/c). It was easier to add dry media back in to the top of a piece. Now that I work mainly in acrylic (except when travelling) it is not so easy – the dry media slips off the top of the acrylic paint. If you have a solution for this (e.g. white or coloured pens, or other dry media that works well on top of acrylics) please let me know. Doorway to My Soul, 15 x 22 in, w/c, dry media, gesso, acrylic, heavy texture on paper. This piece was originally done in w/c on location. Later, I converted a rather boring painting of a flower-filled window box into a mixed media mystery with many intriguing and abstract elements. I added layers of texture thru a grid and a letter “r” template, with gesso and chalk pastel to add highlights. The man was a very willing model in Rajasthan, India. 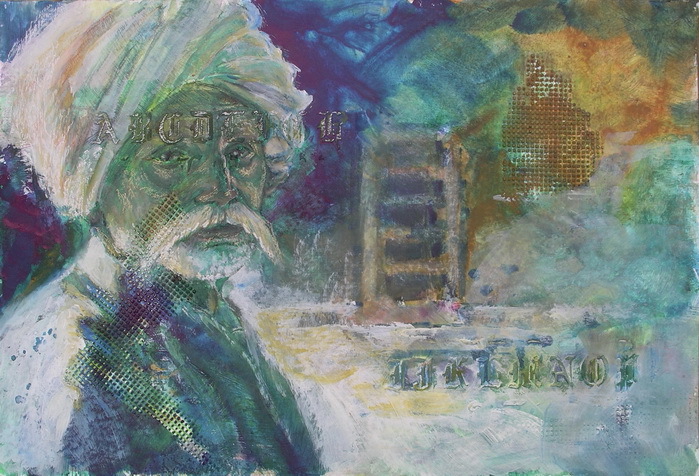 His white turban indicates he is from a farm-owning caste. He followed me around a market in Jaisalmer practically begging me to take his photo. I did…. many times. One of my problems is that I often paint too long and too much and don’t stop when I should. You get the picture. (I also frequently “should” on myself!) Even after the painting is completed and more realistic than I wanted, I tell myself that it fixable. I will now drip and pour on top of the image to obscure parts of it. 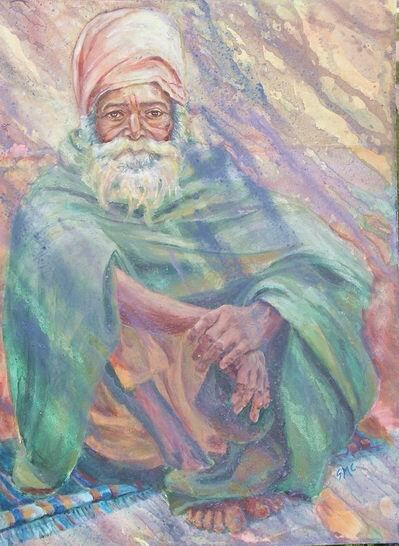 I tried this over-poring technique with Ganga Mendicant, (30 x 24 in) below. As you can see, I was too gentle in my attempts and the image is only very slightly obscured. However, even though I wish I hadn’t painted so realistically, my left brain often gets enraptured with the finished image; I fall in love with it. While it was not what I was originally aiming for, part of me is pleased with the outcome and reluctant to change it. Oh hell! At this point, I can’t seem to get myself to obscure it. So I sign it and tell myself, I’ll just paint another one to achieve my original goal. This, apparently, is not just a problem for me. Few of us know when to stop. The American artist Whistler was banned from his own vernissages because he went around with a paintbrush trying to fix his works during a show opening while the audience looked on. So….I am back to attempting to let my pieces be finished earlier in the process. To get myself to stop earlier! In my next post I will share a few techniques I use to try and trick my left brain into stopping. But, I have to admit, nothing really works for me. I’d love to know of any techniques that you find useful in your creative work; just jot them down below. 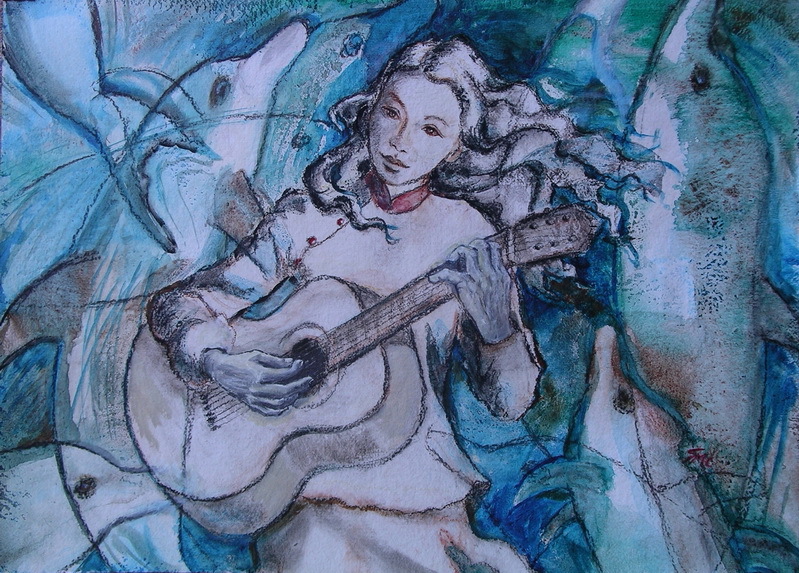 In Dancing with Dolphins (30 x 22 in, mixed media on paper) I have been more successful at following my intention. The viewer can clearly see that lots of the paper is left unpainted, and my drawing lines are clearly visible. Which do you prefer? You are too funny! Just keep going. Why is that a difficulty? Good post. At Art in the Barn yesterday, I saw a lady sitting on a chair staring intently at some small paintings of trees. When she noticed me she seemed startled, and said, “Oh, these are mine and those over there are my husband’s.” I told her she looked like she had found something she wanted to change, and she admitted that she was always wanting to go back in and put a dab of paint here or there. I said, “Don’t do it,” mainly because I’ve wrecked more than one that way. I will remember this blog posting next time I’m tempted to do that. Thanks. Thanks for your comments Karen. Knowing when to stop is always a conundrum. If I am sitting in my living room even years later staring at my paintings on the walls, they will be the ones I want to tweek. I don’t often ruin them but I sometimes have 3 or 4 good paintings underneath the one I finally leave alone or sell.